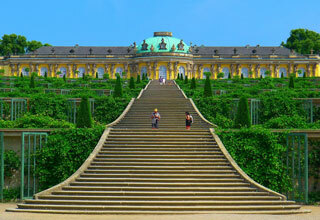 Sanssouci is the former summer palace of Frederick the Great, King of Prussia, in Potsdam, near Berlin. It is often counted among the German rivals of Versailles. While Sanssouci is in the more intimate Rococo style and is far smaller than its French Baroque counterpart, it too is notable for the numerous temples and follies in the park. This article uses material from UNESCO World Heritage List article "Palace Sanssouci", which is released under the Creative Commons Attribution-Share-Alike 3.0 IGO License.